A Cheetah begins life as a pile of aluminum sheets. These eventually become the monocoque section of the chassis. The sheets are sheared to size, then loaded into a very large Amada 344 NC turret punch press (shown in the photo on the left). Each sheet is loaded one at a time onto the press' X-Y coordinate actuator. After the operator engages the machine, computer control takes over and automates the punching of all holes and the cutting of all edges, producing precise and repeatable parts. The various shapes for the monocoque sections that come out of the punch press then get readied for bending. 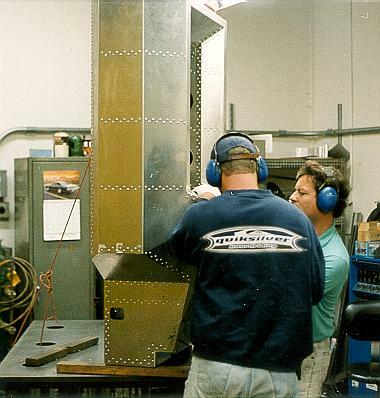 Excess material outside the desired pattern is removed, and the edges of each piece are filed and de-burred. Some pieces have holes which are formed to add strength to the sheets. 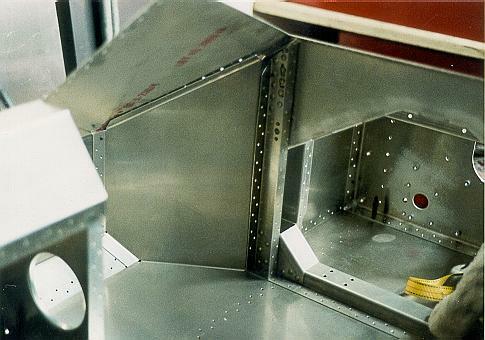 The holes also allow access to the inside of the monocoque compartments during and after assembly. Some of these holes are also later used to route electrical wires, control cables, and the fire system plumbing. 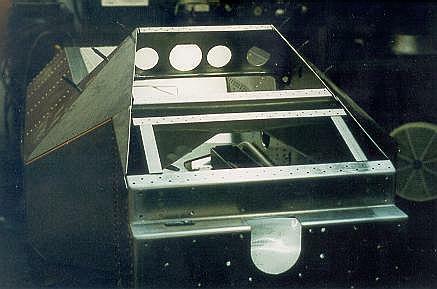 This photo shows a side structure from the inside looking out (without the inner panel installed). The formed holes are visible in the lateral supports. Some pieces are then bent at one of several Diacro or Amada NC press brakes (shown in the photo on the left). These brakes allow repeatable precise bends to be made at the proper location and with the correct bend angle. Other pieces are welded together to achieve their desired shape. 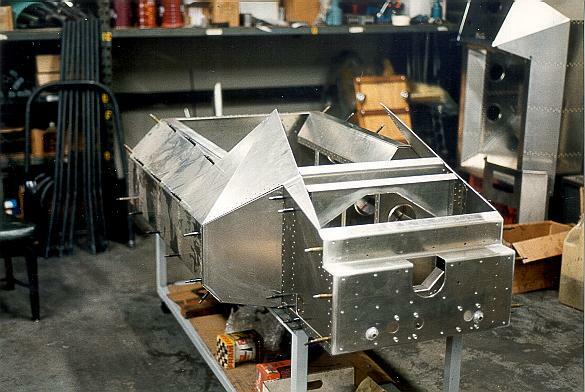 Once the various pieces are cut, bent, formed, and welded, they are ready for assembly. The pieces are put together and temporarily held with Cleco fasteners to ensure that there is a good "dry fit". The pieces are then ready to be permanently riveted. 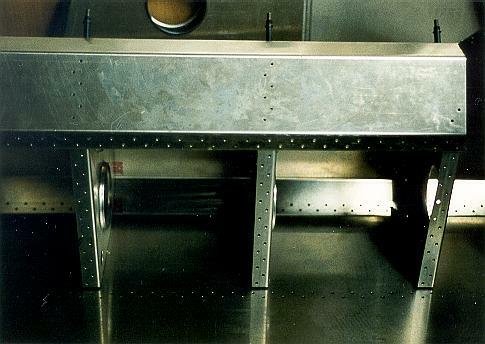 The Cheetah monocoque design specifies the use of aircraft grade rivets which are installed via a "bucking" process, also used in aircraft assembly. For a rivet to be installed, the two pieces of material to be joined must sit flush on top of on another. Each rivet should slide through its hole in the material with a tight fit. (Often, holes are punched smaller than desired so that the eventual mating holes can be reamed in place for an exact fit.) The back side of the rivet has a mandrel held against it, while the rivet head is hammered by an air rivet gun. Hammering of the rivet against the mandrel causes the body of the rivet to expand in diameter, in the already tight hole, and also flattens the back side. 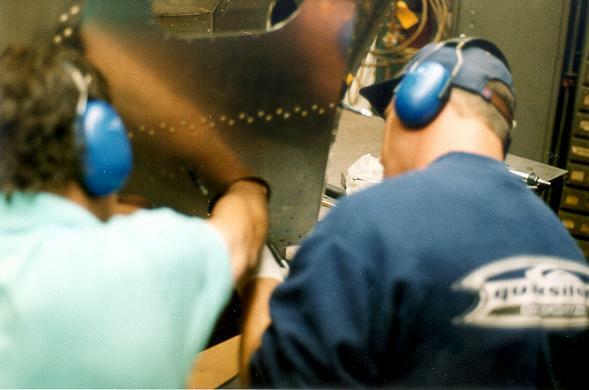 Bucking rivets is a labor intensive operation requiring two highly skilled personnel to achieve quality results. 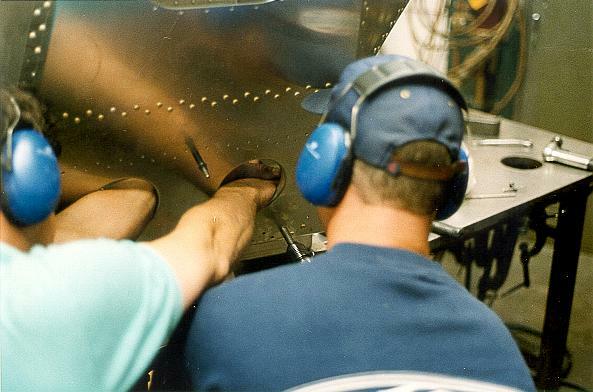 On only a few areas of the monocoque, where the back side of the rivets are inaccessible to a mandrel, are structural grade "pop" rivets used. 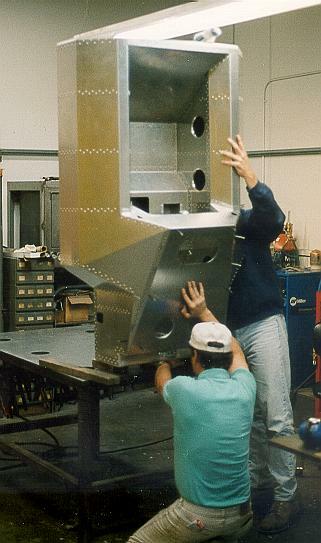 This shot shows the left front internal structure before the inner side panel has been assembled and riveted in place. The left side of the image is the area directly behind the left wheel, where the water pipes to the radiator will later run. The right side shows the foot box with the hole for the clutch master cylinder visible. 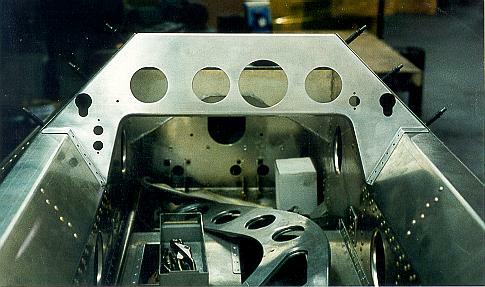 The front roll hoop resides inside of the monocoque, and the down tubes connecting the rear hoop to the front hoop pass through the dash. Therefore, the front top panel and the dash are not install until the roll cage has been fitted. The dash panel in these photos was only in position here to facilitate visualization of the layout for gauges and switches, which is specified by the customer and unique to each car. 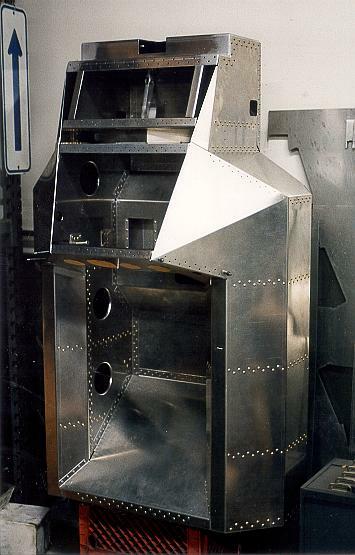 This image shows some of the intricate internal support structure of the monocoque. The U shaped hole at the bottom is where the steering column will pass through the front. Again the dash is only Clecoed in place at this point. The dash roll bar is not in place at this time.